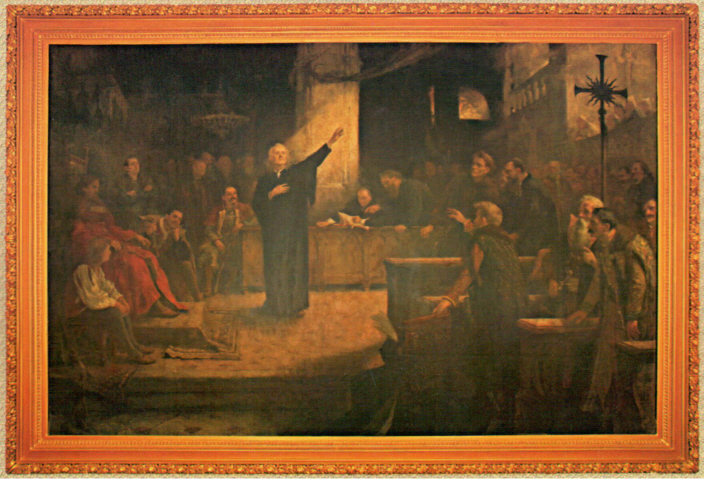 “The Proclamation of the Act on Religious Freedom at the 1568 Session of the Transylvanian Diet” by Aladár Körösfői Kriesch, 1896. Three translations of this short act are given. The first which appears in David B. Parke’s The Epic of Unitarianism (Starr King, 1957) is by the Sate Alexander St. Ivanyi, a onetime Unitarian bishop in Hungary, who went into exile after World war II and served as a Unitarian Minister in the United States for many years. The second translation is in John Erdö’s Transylvanian Unitarian Church (Center for Free Religion, 1990). Enid is a leader in the Transylvanian Unitarian movement, who was a political prisoner in the 1960’s. The third translation by Dr. Judit Gellérd is from the Erdö book. Dr. Gellérd lives in California but grew up in Transylvania. The tremendous import of the Torda Act is not only historical (a unique breakthrough for religious toleration) but also remarkable for its first enunciation of the contemporary Unitarian concept of “freedom of the pulpit and freedom of the pew.” The Act also cuts the church loose from state control and takes away any mediator between the individual believer and the divine (“since faith is the gift of God”). 1) Why was such an important Act so largely ignored, quickly forgotten, and little remembered outside remote tomes on Unitarian history? 2) Did the very freedom of the Act lead to a radicalism that killed the Unitarian promise? See Earl Morse Wilbur, A History of Unitarianism, vol. 2 (Harvard, 1952), chapter V.